Clement Greenberg, New York (acquired directly from the artist). Vincent and Sheila D. Melzac Collection, Washington, D.C.; sale, Christie's, New York, 3 May 1989, lot 19. M. Fried, Morris Louis, New York, 1971, pl. 103 (illustrated). D. Upright, Morris Louis, The Complete Paintings, A Catalogue Raisonn, New York, 1985, p. 150, no. 193 (illustrated). Bennington, Vermont, Bennington College, Morris Louis, October-November 1960, no. 4. Regina, Saskatchewan, Norman MacKenzie Art Gallery, Three New American Painters: Louis, Nolald, Olitzki, January-February 1963. Bucharest, Sla Dalles; Timisdara, Romania, Musuel Banatului; Cluj, Romania, Galleria de Arte; Bratislava, Caechoslovakia, Slovak National Gallery; Prague, Wallenstein Palace, and Brussels, Palais des Beaux-Arts, The Disappearance and Reappearance of the Image, and exhibition circulated by the International Art Program, Smithsonian Institution, January-November 1969, no. 38. Washington, D.C., The Corcoran Gallery of Art, The Vincent Melzac Collection, December 1970-January 1971, no. 77 (illustrated). Smithsonian Institution, National Collection of Fine Arts, 1971 (on extended loan). West Palm Beach, Florida, Art Museum of the Palm Beaches, Norton Gallery and School of Art, The Vincent Melzac Collection, Part One: The Washington Color Painters, January-February 1974, no. 21 (illustrated). London, Hayward Gallery; Dusseldorf, Stdtische Kunsthalle; Humlebaek, Louisiana Museum of Modern Art, and Brussels, Palais des Beaux-Arts, Morris Louis, June 1974-April 1975, no. 14 (illustrated). Bonn, Rheinesches Landesmuseum; Belgrade, Museum of Modern Art; Rome, Gallery of Modern Art; Warsaw, National Museum of Poland, and Baltimore, Maryland Science Center, Two Hundred Years of American Painting, 1770-1970, June 1976-February 1977, no. 47 (illustrated). Jerusalem, Israel Museum, and Tel Aviv, Tel Aviv Museum (no. 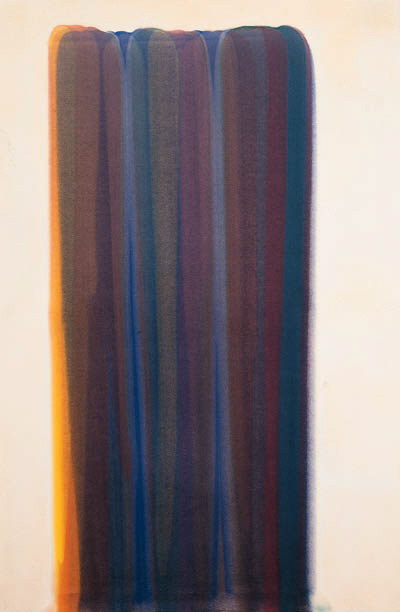 7), Morris Louis, November 1980-April 1981, no. 1 (illustrated). Edmonton, Ontario Art Gallery (on extended loan).